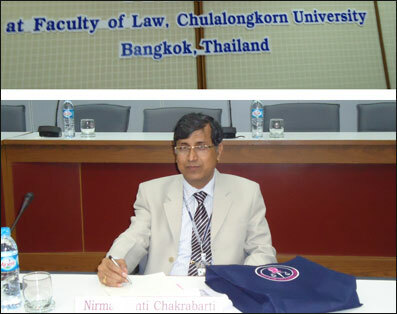 Prof. N. K. Chakrabarti, Director, School of Law, KIIT University has participated in the Asia-Pacific Law Deans’ Forum 2012 organised by Chulalongkorn University, Law School, Bangkok, Thailand in collaboration with International Association of Law Schools (IALS) during 1-2 March 2012. The meeting was participated by the Deans/Directors from Thailand, Bangladesh, China, India, Indonesia, Malaysia, Singapore, Sri Lanka, South Korea and Vietnam. As the world becomes more globalized and relationship among the international community more integrated, the forum is intended to serve as a venue to brainstorm ideas to tackle challenges that the legal education in countries across the Asia-Pacific region are now facing.